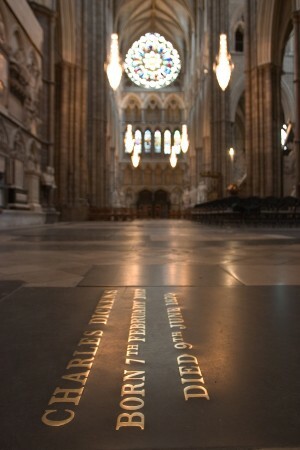 A wreathlaying ceremony to commemorate the bicentenary of the birth of Charles Dickens will take place in Poets’ Corner, Westminster Abbey, at 11am on Tuesday 7 February 2012. Westminster Abbey will celebrate the bicentenary of one of Britain’s greatest writers with a wreathlaying in the South Transept. The ceremony is one of a number of events being held this year to mark the anniversary of the great Victorian writer, who is buried in the South Transept of the Abbey. The wreathlaying ceremony will include readings from the Dickens’s novels and his other writings by actor and director Ralph Fiennes, author Claire Tomalin and two of Dickens's descendants. All tickets for this event have now been allocated.